We discovered the HX200V to be a solid performer, equipped with a range of pre-set filters, as well as the capability to shoot 3D photos and panoramas. And it is fast, acquiring focus in a snap and allowing us to shoot multiple pictures without any discernable lag. Overall, it is a well-rounded package that appeals to users who value image quality and the versatility that comes from having the ease of a point-andshoot combined with the flexibility of manual controls. The camera has excellent build quality. Though it is all plastic, the construction feels solid. Also, a rather large DSLR-like righthand grip helps the user keep the camera steady while clicking pictures. Very good image quality in all shooting conditions: Colours look bright and vibrant, and details look sharp and clear. Features like panorama mode and HDR work well. You can zoom in and out while shooting movies, and subjects remain in sharp focus. The camera records audio in stereo sound. Usually, the mechanical zooming in and out of the lens introduces audio disturbances in videos. But on the HX200V, the interference was barely audible. The HX200V has a problem while focussing on subjects closer than three metres if you are using maxed-out zoom. Not exactly recommended for macro photography. 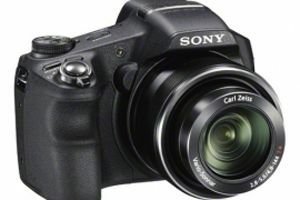 While the camera offers 30x zoom, we would have liked to see some more at this price point.